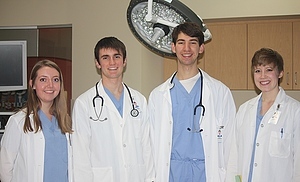 Miranda, along with fellow Luther students Joy Harris, Andrew Carlson, and Robert Manges, spent January shadowing physicians at the Gundersen Health System in La Crosse, WI. In addition to shadowing, she got hands-on experience which included how to make a cast splint, and sutures; laparoscopic surgery techniques; and how to perform an echocardiogram. By exploring many departments, Miranda saw all the different parts that go into providing adequate healthcare. 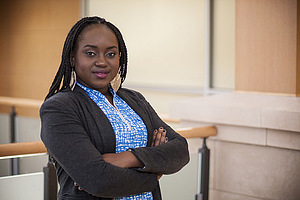 Her time at Gundersen has increased her desire to attend medical school and become a physician. 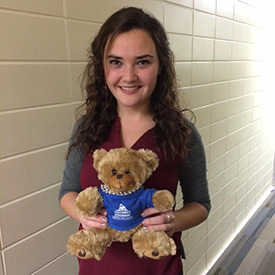 During her J-term, Emily launched a music enrichment volunteer program for the pediatric oncology/hematology department at Erick Peter Person Children’s Cancer Center in Duluth, MN. 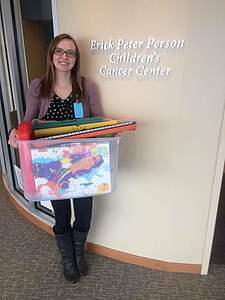 Emily wrote a grant proposal to get funding, trained and recruited volunteers, created the curriculum, and led music programs for the pediatric cancer patients in both the clinic and hospital. During her time, she gained skills in communicating and connecting with patients and their families. For Emily, it was rewarding to provide a creative outlet for young patients spending too much time in the hospital and clinic. She also learned how important it is to work with various health professionals to give the best care possible. This includes working with physicians and nurses from all departments, therapists, social workers, and others. Finally, she got to see the value of integrative health care services like music therapy, aromatherapy, art therapy, and massage therapy. During January, Rachel discovered her true passion. It started on a whim with a Google search about prosthetics in the army. A few emails later, she secured a two-week internship at Walter Reed. She interned as an observational student in the following departments: prosthetics and orthotics, traumatic brain injury (TBI), amputee occupational therapy, amputee physical therapy, music therapy, behavioral health (PTSD and Anxiety based), and service/therapy dog training. During this time, she saw many soldiers and heard many inspiring stories. She enjoyed seeing the soldiers work so hard through therapy to become high-functioning civilians once again. Her career aspirations now include working with injured servicemen as a prosthetist. 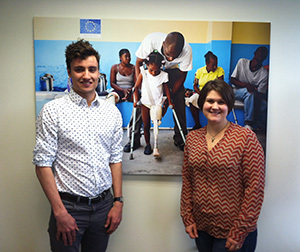 As a non-profit based out of France with branches in multiple countries including the United States, Handicap International works to assist people with disabilities in developing countries, especially in areas that have undergone recent disasters. Last year alone, Handicap International helped over 2 million people in 59 countries. Over January, Patrick worked as an intern in Washington D.C., focusing primarily on marketing research and analysis and how their current strategies correlated with fundraising. Patrick works with social media at Luther, and he found it interesting to see how marketing can work at a higher ed level and for a non-profit organization. Since Handicap International is not as established as other non-profits, Patrick was able to witness notable gains in a short period of time. Although still very undecided about his future plans, Patrick found the work very interesting but realized a 9-5 office job may not be the best fit for him, preferring more hands-on work and personal interactions. Kajsa spent her January assisting Springboard for the Arts, an artist resources organization that connects artists with communities, and Nautilus Music-Theater, a small music-theater company in the Twin Cities that creates original music, theater, and opera pieces, as well as innovative productions of existing work. Her involvement with Nautilus included observing an artistic team and filling the role of production assistant for a local performing arts production of “Fugitive Songs,” where she was a part of the rehearsals and performance. Putting up a production in three weeks was complex and difficult, but Kajsa found it very rewarding to be a part of the process. At Springboard, Kajsa helped monitor the Artist Resource Center, attended a resource fair, and worked with the company’s online Artists Services Directory to build a more efficient process for the community. The staff at both organizations helped Kajsa understand what possibilities are available for her as a future artist and administrator. She admires the people she worked with and feels many of the connections she made will continue to be strengthened in the future. Based out of Portland, Oregon, Portland Alternative Designs is a tiny-house consulting company that partners with companies such as Shelterwise (tiny-house design and construction) and Iron Eagle Trailers (custom trailers for tiny-house needs) to provide advice, run workshops, and educate anyone interested in living tiny. Throughout January, Jonathan was involved with a tiny-house mixer to showcase current projects, a building workshop discussing specific concerns for tiny-houses, visited Caravan (a tiny-house hotel), and attended an Airbnb presentation and forum. 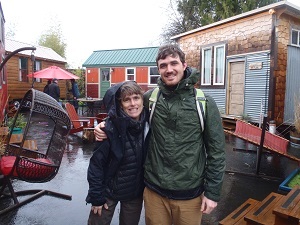 He found the entire experience incredibly interesting and especially enjoyed seeing first-hand how much progress the tiny-house movement has made since its origination in 2002. After his internship, Jonathan has brought his interest in tiny-houses to Luther by working with Stratis Giannakouros and the Luther Sustainability Department. On April 25th, he plans to organize a presentation, featuring local speakers and providing time for questions and audience interaction. Children’s Discovery Academy is a privately owned child care center in Minnesota. They believe in developing the whole child including social, emotional, cognitive, and physical elements. Lauren focused on the business side of Children’s Discovery Academy, allowing her to work alongside the director in the office and learn the financial aspects of an organization. During her internship, Lauren was responsible for answering questions from parents, recording and processing payments, revising classroom newsletters and calendars, scheduling events, and completing a daily check to make sure staffing was in order. 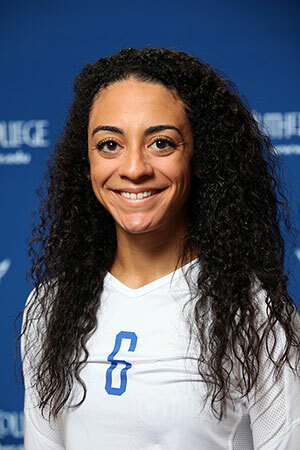 She even found her Information Systems class at Luther was valuable when creating a new roster system because she could make the Excel document colorful, easy to ready, and build in equations to minimize inputs. Overall, Lauren found her experience incredibly rewarding and feels her business management and accounting major can impact almost any business. She hopes to experience in future jobs the same level of passion Children’s Discovery Academy employees have on a daily basis. 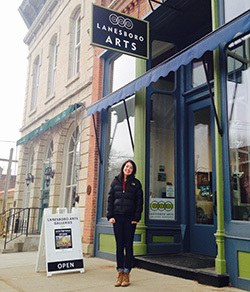 This past January, Kara spent her time as an intern for Lanesboro Arts in Lanesboro, Minnesota. The business acts as a creative outlet and benefits the public by providing galleries, performing arts space, artist residencies, and educational outreach. Kara kept plenty busy over the month by helping with general administrative duties, such as mailings and filings, taking pictures for and adding information to their new website, creating an advertising email, researching past and potential grants, advertising and hosting two events, and organizing art supplies for educational classes. One project she spent a lot of time on was comparing the potential revenue and actual revenue created from the rented art lofts. Kara found it would be more cost efficient to turn one loft into an office space since it had such low rental sales, and developed a new way to market the other loft to encourage additional rentals. After her internship, Kara found the variety of tasks, constant use of creativity, and the teamwork required to make progress increased her excitement to work in a non-profit someday, preferably one that makes positive impacts on the community and the economy through art. Last January, Maria worked at the Timorese Government institution in the Ministry of Commerce, Industry, and Environment in East Timor. The department’s work was divided into two parts based on the Environmental Awareness Treaty, focusing on East Timor’s carbon emission reduction goal and raising community awareness on the issues of climate change. As an environmental studies student, climate change was not a new subject for Maria. However, she was unfamiliar with the specific situation of East Timor so much of her internship was spent reading East Timor Environmental Law and comparing it with the Global Environmental Law set by the United Nations. During her internship, Maria put together a social service project on environmental concerns for children under 14 at an orphanage. It was challenging to simplify the information, but Maria was excited with the outcome because the children showed a greater understanding of the environment when it was finished. This internship gave Maria the opportunity to experience what it's like to work in her home country and confirmed her interest in environmental work as a possible future career. St. Croix Therapy in Hudson, Wisconsin is a clinic that offers therapeutic services to children and adults. As a non-profit whose mission is “reaching higher potential and creating new opportunities,” they incorporate therapeutic services with social and emotional interactions to improve the quality of life for children and adults. Since it was a volunteer based internship, Alyssa got to experience a wide variety of tasks such as shadowing staff, interacting with client sessions, and working on projects ranging from cleaning bathrooms to creating handouts for future interns. Her favorite part was interacting with clients and therapists, which helped build excitement for a possible future with occupational therapy. One key project Alyssa worked on during her internship was creating an example packet for future interns who wanted a letter of recommendation from St. Croix Therapy. By including a personal statement, resume, skills, and strengths, the organization can write a more direct and focused letter to benefit the intern. 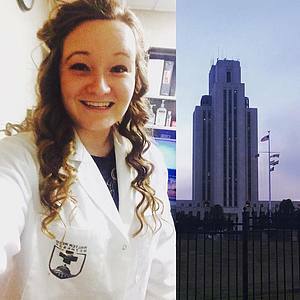 Overall, this experience helped Alyssa discover what it might be like to work in a clinical setting, making her feel more informed and prepared for the future. Silver Tree is a marketing, advertising, and public relations agency located midway between Chicago and Milwaukee. Kalla was challenged to jump into her J-term internship with both feet. She performed marketing research for a top-50 university, wrote copy for retail advertising, and conducted website analysis for a healthcare client, all in just a few short weeks. This was a "hybrid" internship, in which Kalla spent some time in Silver Tree's offices in Kenosha, but also spent much of her internship working online from her family home in Mount Prospect, Illinois. She came back to campus with a new understanding of the wide variety of tasks involved in communication work and a greater appreciation for the way her Luther courses emphasize learning to write in a variety of styles. "I think it is just very interesting that there are so many media that we can write for, and how the dynamic and way that we write for each is vastly different than another," she reflected. "This is what I think makes writing so much fun." 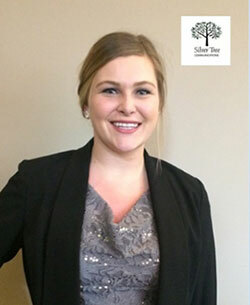 Silver Tree president, Kate Colbert wrote, "I was very impressed by Kalla's level of energy and enthusiasm. She was always willing to take a new project, and exhibited the ability to quickly shift gears and priorities when needed." 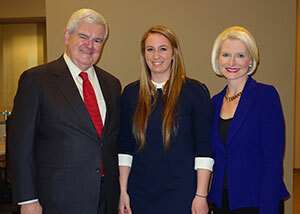 For her third internship in Washington, D.C., Audrey spent last January working with Gingrich Productions. This organization is a multimedia production company based in Arlington, Virginia that works on an array of political projects. As an intern, her main task was to conduct research for speeches, podcast interviews, and essays. Most of her time was dedicated to investigating Boko Haram and terrorism in Nigeria. By the end of the month Speaker Gingrich and Audrey had co-written an op-ed piece about her research that is now published online. While in D.C., Audrey also had the opportunity to sit it on a number of closed-door meetings at the office and on Capitol Hill with the former Speaker of the House. Following her internship, Audrey has decided to return to D.C. after graduation and pursue a career that incorporates both business and politics. 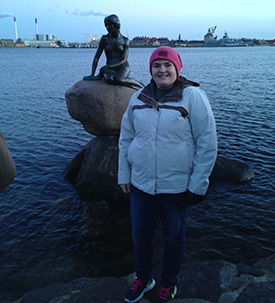 For the month of January, Sarah interned at a private equity firm in Copenhagen, Denmark called CataCap. This organization purchases small Danish companies with potential for growth, builds them up as much as possible, and resells their purchase after about five years. Sarah’s internship involved two main projects. The first project was an analysis of which companies might benefit from being purchased by a private equity firm. Although Sarah does not speak or read Danish, she was able to navigate the financial reports and included over one hundred companies in her analysis work. The second project required her to research licensing companies since CataCap was considering buying one. It was new, unknown territory and they were unaware of how difficult it might be to resell. After her month abroad, Sarah is comfortable in a small business setting and feels working internationally has removed the fear from living in an unfamiliar setting with a future job placement. 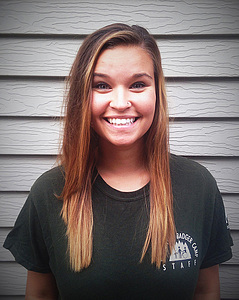 Deveny spent this past January as an intern with locally owned Dry Run Studio. 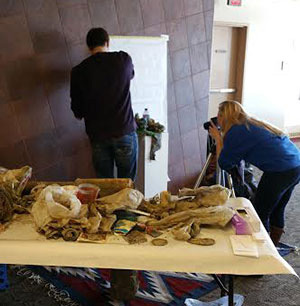 She helped brainstorm, plan, and execute several artistic projects connected to Body of Water the interdisciplinary production performed at Luther College. The projects Deveny worked on varied from art installments around Decorah, to a participatory performance on campus and the planning of several educational workshops for different age groups, combining dance and biology. All of these projects were designed to raise awareness about local water issues and a general awareness of water usage. During her time with Dry Run Studios, Deveny was surprised how much thought, time, and work is put into the artistic process, from discussing many possibilities all the way through the execution of the final projects. She learned to collaborate with other artists, discussing and trying new ideas and concepts. She experienced the process of finding a venue for the finished projects, not only an available space, but the one that would showcase the project the best. Finally, the workshops that she helped develop showed her how the arts can inform and improve the understanding of other disciplines for people of all ages. Gundersen Health System is recognized as a national leader in medical care with a series of satellite clinics throughout Wisconsin, Iowa, and Minnesota. As a hospital, they have innovative policies relating to palliative care and a patient-centered approach to medicine. Over the month of January, Carter spent most of his days shadowing resident physicians as they rotated through their different services in the hospital and clinic at La Crosse, Wisconsin. He was also able to shadow physicians in any department he was interested in learning more about, such as pediatric hematology/oncology, pediatrics, palliative care, surgery, and many others. 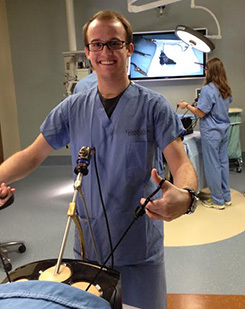 One of Carter’s favorite aspects of the internship was getting to teach sessions with his mentor, Dr. Kyla Lee, where he learned the basics of an EKG/ECG report, how to suture incisions, and an introduction to laparoscopic surgery techniques. Throughout his experience, Carter was amazed and inspired to witness every physician listen to and address the concerns of their patients and families, no matter the urgency of the situation. Leaving the internship with support from all of the physicians he collaborated with, Carter feels he has all the encouragement he needs to continue down the path of becoming a physician himself someday. The Illinois Sustainable Technology Institute (ISTC) is a research laboratory affiliated with, and funded by, the University of Illinois. While research ranges from biofuels to river effects, Sheri was mostly involved with a project that studied the viability of using charred waste biomass (i.e. tree woodchips, mown grass, and manure waste from farms) to fertilize fields while reducing carbon emissions. At the beginning of the internship, Sheri primarily used various data analysis machines, prepared samples of mown grass, and weighed samples. However, as she became more familiar with the project, Sheri prepared groundwater and wastewater for analysis with a liquid chromatograph/mass spectrometer by filtering, suspending, nitrogen drying, and weighing the samples. Eventually, she was even trusted to edit one of the reports a doctor was about to publish. 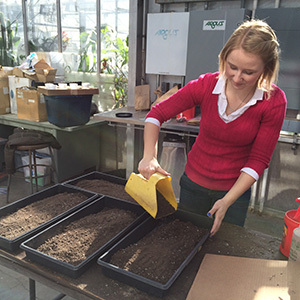 Although she worked on a variety of projects, Sheri was most involved with the biochar process. It was a very rewarding experience to learn its practical uses as fertilizer, feed supplement, water filtration, battery additions, and carbon sequestration, while minimizing the released carbon from decomposition after burning samples in specialized furnaces. Sheri’s internship has strengthened her belief that chemistry is a wonderful way of understanding the world, and plans to use her chemistry major to help the environment in the future. She may even add an environmental science major to her degree to continue her education in the field. 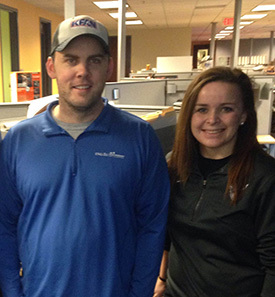 Last January, Paige worked for the iHeartMedia company in Minneapolis and specifically under the KFAN Sports Radio. This station covers Minnesota professional and collegiate athletics with four shows throughout the day, hosted by a variety of radio figures. 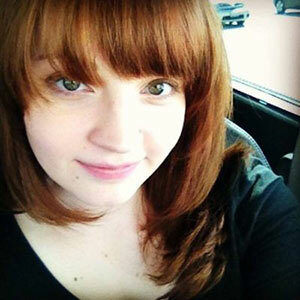 At KFAN, Paige worked at the shows, such as the “Paul Allen Show,” and was in charge of greeting guests, answering fan call-ins, running prize giveaways, and setting up interviews. She also learned how to use editing software to cut audio clips and set each of them up for podcasting. In her spare time, Paige would sit in a recording studio and practice creating her own show. At the end of her internship, Paige was sent to the University of Minnesota to sit in on basketball or hockey press conferences and record the audio for future shows. Throughout her experience, Paige is most proud of her time on-air. She loved reading the vibes of the conversations and is proud to have both Paul Allen and Ben Leber compliment her voice and mention she has a bright future ahead. This internship gave her complete insight to the media world of radio, allowing her to compare it to other forms of media and decide which might be the right fit in the future. 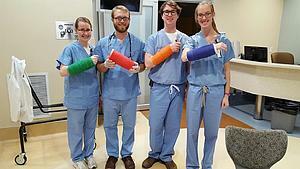 During a recent J-Term, Laura interned with a variety of care facilities focusing on physical therapy. OSI Physical Therapy and NovaCare Rehabilitation, both outpatient physical therapy centers, work on long-term physical therapy plans for patients who have had surgery, as well as those with chronic pain. Laura also worked with HealthEast Home Care which sends a physical therapist (PT) directly to the home of patients. Often these patients were elderly or recovering from surgery and were not yet mobile enough to make it to an outpatient physical therapy clinic. At Woodwinds, the PT's worked with patients who were only one or two days out from surgery and had not left the hospital yet. During her internship Laura observed the work of the PT's and got to see the progression of various injury rehabilitation cases and methods. Her favorite part of this experience was getting to see the different stages that patients go through when recovering from an injury. It was always exciting and very rewarding to see the patients make progress from visit to visit. 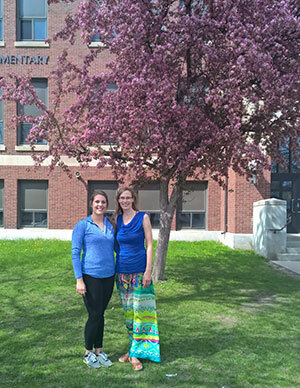 After graduating from Luther, Laura plans to attend graduate school in order to get her Doctorate of Physical Therapy. 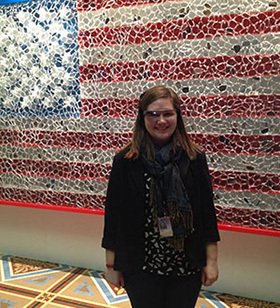 Because of this internship, Laura knows that this is the right career path for her. Crave Dance Studio in Decorah, Iowa is dedicated to providing quality instruction that focuses on technique while fostering creativity and love of movement. 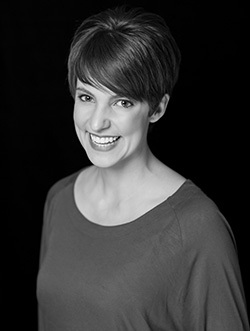 In the classroom, Holly was given the opportunity to instruct children (ages 5-12) in hip-hop and adults in tap. On the administrative side, Holly organized and marketed a free "Stretch/Leaps/Turns" class, created a mock dance studio with start-up costs and a budget, and compiled a timeline of mental and physical abilities in young dancers. Holly hopes to open her own dance studio in the suburbs of Minneapolis within the next two years and is currently working on the business plan. Because of her formative internship at Crave Dance Studio, Holly feels prepared for all aspects of owning a dance studio and is excited to make her dream a reality. Tanager Place is an inpatient clinic in Cedar Rapids for kids aged 5-17 who have behavioral disorders. As well as providing inpatient services, they have an outpatient clinic, school, program for research on autism, and an inpatient clinic for children with more severe developmental disabilities. Kaitlin spent all of her time in one of the cottages, helping with various activities and daily routines. Her main task was to get in the kids' living spaces and to learn what it might be like to live and work in an inpatient setting. The supervisors were impressed with Kaitlin’s work, commenting on how willing she was to help and listen to kids, especially if they were having a rough day. Before becoming an intern at Tanager Place, Kaitlin only knew she wanted to do some form of therapy. Now she is considering getting her masters in clinical social work and becoming a therapist for kids or a treatment counselor in an inpatient setting. 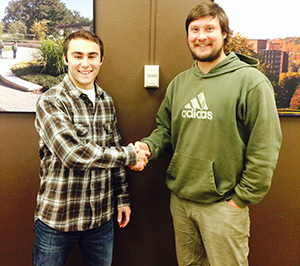 Ben spent his internship this past January in Moline, Illinois working for a physical therapy company called O.R.A. Rock Valley Physical Therapy. There he shadowed Steve, the owner of the company, and other physical therapists as they helped patients through their different injuries. Ben's primary task was to observe Steve's interactions with patients and examine how he diagnosed and determined rehabilitation for the different injuries. In addition to shadowing, Ben was also given the opportunity to help some of the patients through their routines and exercises. He really enjoyed helping the patients in such a direct way because it gave him insight into what he will be doing later in life. One patient they saw had terrible sciatica pain and the doctors couldn't use surgery to repair it because of some other complications. Although Ben and the other physical therapists weren't able to help this man fully recover because of the severity of his sciatica, they were able to help reduce a lot of the pain. This showed Ben that he could really change a life by helping someone grapple with chronic pain and providing care in ways that other doctors couldn't. This experience only made Ben positive that this is what he wants to do for the rest of his life. Ben can't wait until he graduates from physical therapy school and can start helping people overcome their injuries. Evan spent his January working with Rebecca Handler, a professional conceptual photographer based in New York City, by planning and carrying out photo shoots. His tasks included interacting with modeling agencies, assisting with light tests, and managing equipment. 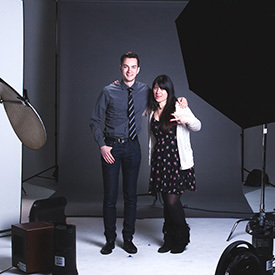 He also learned about the business functions of operating a photo studio and marketing to potential clients, and gained valuable experience in post-production techniques, including retouching images. Evan was excited to have the opportunity to learn from Rebecca and her staff and interact with other creatives (art directors, models, filmmakers, and make up artists) in New York City. This internship gave Evan a much clearer idea of what it takes to progress in this field, and strengthened his commitment to pursuing photography as a career. Grass Run Farms is a collaboration of family-run farms in the Upper Midwest, producing and marketing 100% grass-fed beef. Their mission is to make high-quality, affordable, pasture-based meats accessible to anyone interested in healthy food and community values. Casey was able to help assist the company’s mission with his internship this fall by focusing on wholesaling, marketing, website analysis and design, and sales. With his internship supervisor, Dan Bellrichard '01, Casey set up a wholesale system online for retailers to place orders and gain information about selling Grass Run Farms products in their stores. Not only has this internship increased his passion for marketing and operations, but Casey has enjoyed Grass Run Farms so much he hopes to be employed there someday! 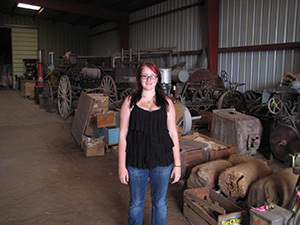 During Tia's summer collections internship, she worked on a large inventory and collection assessment project for the State Historical Society of North Dakota. Working alongside another intern, they focused on a full inventory of a storage unit, with some objects not yet integrated into permanent storage that were held at the State Park of Fort Abraham Lincoln. Once collection items were inventoried, they were assessed for proper processing as museum holdings, equipment, or unwanted items. Working with the Historical Society’s collections committee, Tia helped to create a plan for processing the inventoried objects according to their planned disposition. Along with her own project she got to witness other aspects of the Historical Society as they developed their final plans for the installations of their new galleries. The internship inspired her to continue the interest of doing registration work as she enjoyed presenting objects the the collection committee for approval for integration into their collections. As a double major in history and anthropology with a minor in museum studies, Emily was excited to be an intern for the National Air and Space Museum in Washington, D.C. It is one of the most visited museums in the country and works to commemorate and preserve the history and progress of aerospace technology. Emily worked in the collections department, which is in the process of moving the entire collection to a new storage facility. Her main tasks involved updating the documentation of various artifacts, as well as cleaning and moving medium-sized artifacts such as aircraft engines. One especially memorable moment of Emily’s internship was when she got to survey the tools used for the Apollo Lunar Module, getting a behind the scenes tour of the NASM’s spacesuit storage holding Neil Armstrong’s Apollo 11 suit. 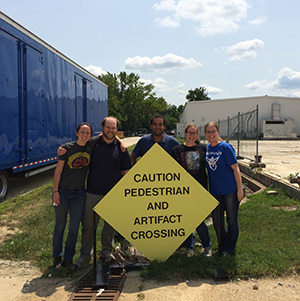 Overall, this experience renewed her love of space history and provided Emily with valuable work experience to help with future grad school applications and a future career in museums. 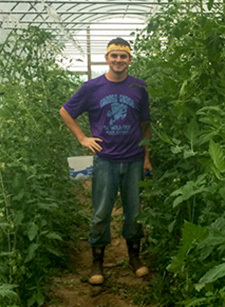 Last summer, Connor worked at two vegetable producing farms in the Decorah area. Root River Farm is a USDA certified organic farm specializing in MicroGreens and bulk vegetable sales, while Patchwork Green Farm is not certified organic, but practices organically. They both specialize in individual and some bulk produce sales, primarily at the Winneshiek Farmers Market and Decorah businesses such as the Coop, La Rana, and Rubaiyat. Much of Connor’s summer involved physical garden work like weeding, hoeing, watering, harvesting, and washing, but he also assisted in sales and helped organize a bi-monthly CSA member delivery. Besides learning how to drive a tractor and cleaning over 16,000 heads of garlic, Connor was able to discover how his love for gardening could become a potential career. Bailey was stationed at a Soil and Water Conservation District (SWCD) in northwest Minnesota and focused on water monitoring, wetland delineation, and conservation projects. She was able to experience the balance of internal SWCD responsibilities, such as attending meetings with the DNR and organizing data, with the exterior field work of gaining support for grants, monitoring soils, and planting trees. As a part of her internship with the Conservation Corps of Minnesota and Iowa, Bailey had the privilege to oversee the construction and implementation of a rain garden in front of the Ralph Engelstad Arena and learned the importance of communicating with a variety of organizations and viewpoints. After completing her work last summer, Bailey is confident she wants to work in a field that positively impacts the environment and has become aware of many additional federal, county, and city government positions. Lis, a double major in Theatre and Management spent the summer in Lanesboro, MN as the Administrative Intern for the Lanesboro Arts Center (LAC) which is a non-profit Arts Center that operates a Juries Sales Gallery, the St. Mane Theatre, and is starting the Arts Campus all across Lanesboro. During her internship, she helped out with answering phones and filing, or covering the sales in the gallery. She also did much of the box office for the shows at the St. Mane, including selling tickets and working front of house at the various shows. Lis was also apart of various public art shows that got the community involved. 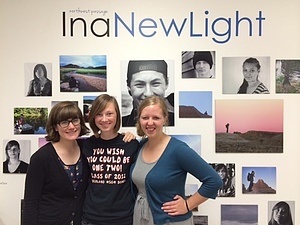 Laura worked as an expressive arts intern at Northwest Passage as part of the In a New Light team, a nature photography program that provides opportunities for hope and healing through art. Located in northwestern Wisconsin, Northwest Passage is a residential treatment center for youth ages 12-17 with mental, behavioral, and emotional challenges. Over the course of the summer, she was able to explore the connection between mental health and sustainability by accompanying youth on photography expeditions along the St. Croix National Scenic Riverway, facilitating one-on-one reflection writing, exploring grant writing, and assisting with Sustainable Living Group, an environmental education initiative at the girls facility. Laura says the experience enabled her to grasp the highly therapeutic potential of natural places. Celebrating its 42nd festival season this summer, Des Moines Metro Opera is the largest performing arts organization in Iowa. 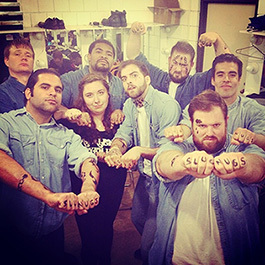 The organization offers three main stage operatic works, produced by over 200 people, including well-accomplished singers, apprenticeship artists, designers, a production crew, and interns. As a wig and makeup intern, Becca washed, blocked, styled, and applied wigs to the singers heads, as well as hats and head pieces. She also helped with makeup and any miscellaneous tasks that needed to be done during the run of the shows. A highlight for Becca was researching, making stencils, and applying temporary prison tattoos to singers using acrylic paint. As a theatre major wanting to go into costume, hair, and makeup design, Becca’s internship gave her a better idea for the industry and made her excited for the career ahead! 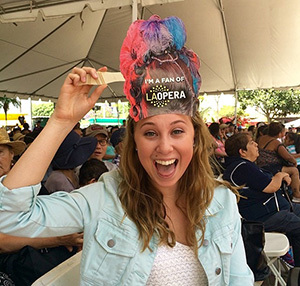 Last summer, Nicole was able to intern for the Education and Community Engagement Department of the Los Angeles Opera. Although she was able to work with a multitude of different programs, her favorite was the Community Circle Seating Program. This initiative worked to increase the amount of community members able to attend main-stage opera performances by granting orchestra level tickets to groups at the sharply discounted price of $9 per ticket. To make this project a success, Nicole communicated with leaders of non-profits, low-income senior centers, and various community groups in order to match each of them with an opera she thought might provide the most excitement and best experience. 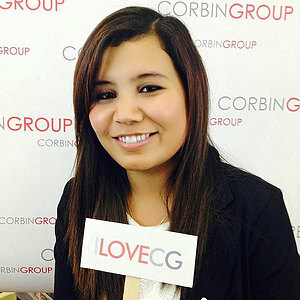 Apart from the Community Circle Seating Program, Nicole also appreciated working with different demographics and community groups within Los Angeles because she felt they provided a powerful and instructive experience. This internship has allowed Nicole to learn and practice skills in arts administration and strengthened her future aspirations to work within this field. Steppenwolf Theatre in Chicago, IL is one of the largest regional theatres in America and is known nationwide for developing and premiering new plays. 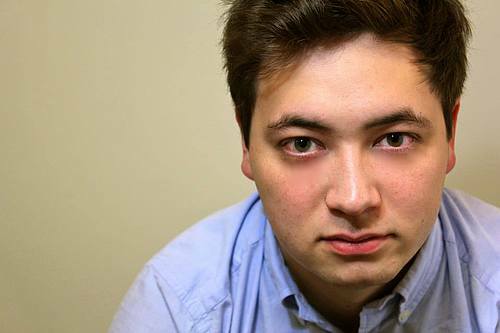 Tim spent his summer as their literary intern, which dealt with agent correspondence, reading and reviewing plays, and an in-depth research of theatre history. One of his proudest accomplishments was establishing a process for cataloging Steppenwolf's commission history, which spans almost 30 years and includes plays that have won Tony and Pulitzer prizes. Tim says it was fascinating to be able to dig through documents and contracts, discover several world famous plays that had been commissioned by the theatre, and now hopes to move to Chicago after graduation to continue working in their vibrant theatre scene. Fabric.com is the world’s leading online fabric store that strives for great customer service and innovation. In the summer of 2014, Melody conducted studies on different associates and departments to help standardize the amount of time processes should take. She gathered and analyzed data from the warehouse and business intelligence software. Melody improved her Microsoft Excel and data analysis skills and developed managerial skills from working with associates and managers. She communicated work problems that associates faced with managers, learned about safety tips in a warehouse, and was exposed to different databases and business intelligence software. She loved the casual learning atmosphere of the work environment that encouraged creativity and leadership. Melody solidified her interest in management because it helped her realize how many opportunities there are for a new graduate with her knowledge and skills in the workplace. 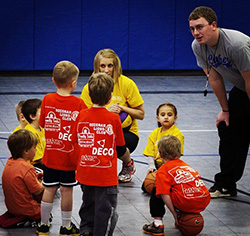 Decorah Parks and Recreation focuses on park maintenance and running children’s sports functions including flag football, little league, and biddy basketball. Last spring, Blake contributed to their efforts by mapping out field dimensions for the various sports, calculating activity prices, and even became a coordinator for a group called "FUN"; an after school fitness program for 1st-4th graders where they played games and learned about eating healthily. After running the six-week program and being responsible for picking the weekly activities, Blake discovered he would love to put his Sports Management Concentration major towards working with kids and hopes to get a sports-related job working with children in the future. Jill Hess spent her internship last spring with the National Portrait Gallery, a Smithsonian Museum compromised of the artwork of important people in history and culture. The majority of Jill’s tasks involved working with the Design and Production team on gallery maintenance, installation and tear-down, and other tasks to keep the department and museum running smoothly. Jill built a strong and positive work relationship with the staff and by the end of her internship was trusted to work independently on her own projects. After this formative experience in Washington D.C., Jill’s focus has been to return to the city because of its cultural and historical ties. Jill is proud to have worked with an important collection in such an established museum and now wants to pursue museum work as a career. 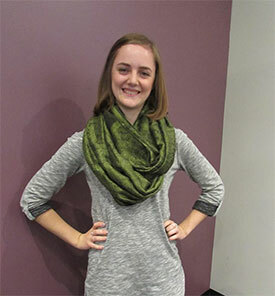 One of Luther’s largest groups of January term interns comes from the biology department. Each year the department facilitates sophomore and junior biology majors in locating internships at various health care facilities. Luther students Lindsey Colyer, Dan Stover, Reed Johnson, and Sarah Floden observed medical procedures in various departments at Gundersen Health System in La Crosse, WI. 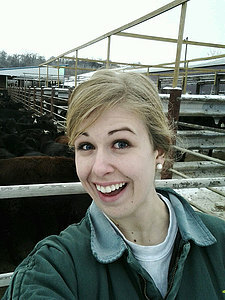 Mariah was the only student who took an internship “selfie” while working with the Decorah Veterinary Clinic in January of 2014. While there she definitely got her hands, and boots, dirty while making rounds to local farms with veterinarians. She also observed veterinarians serve customers and their pets at the clinic. Luther alum Chris Gade, who is the Director of External Relations at Mayo Clinic, helped arrange Shelly’s internship this past January. Shelly assisted with the planning for the celebration of 150th anniversary of the founding of Mayo Clinic. This included writing news releases and other promotional materials, as well as participating in planning meetings related to the celebration. Shelly, on the right, is a management and psychology double major. 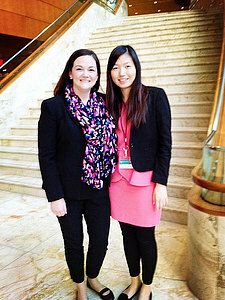 Standing next to Shelly is her internship supervisor Alaine Westra, Public Affairs consultant for Mayo Clinic. Lauren input an entire competency record for the laboratory at Winneshiek Medical Center into their Healthstream Learning Management System. Lauren learned the skills the lab professionals must possess, and also how a learning management system contributes the process of continual improvement and staff development for any organization. She completed the project ahead of schedule, and was able to be involved in other staff development projects. 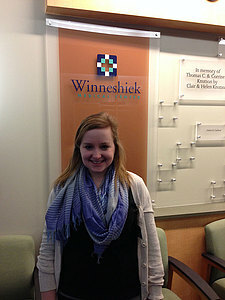 Lauren’s experience added to her desire to work in the healthcare industry. Over the years, the Decorah Police Department has worked with Luther students who have an interest in law enforcement. Ronell Quinones, a management major, was able to rotate with different officers and see how they each did their jobs. He learned everything from managing resources to solving problems that typically arise at the scene of an incident. His experience was positive and helped Ronell affirm decision to pursue law enforcement as a career. 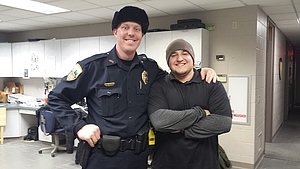 Ronell, on the right, is pictured with Decorah Police Officer and Luther alum Chris Wuebker. Fairview Ebenezer is a company linked with a hospital in Minneapolis that provides seniors with the proper living arrangements, whether that be assisted living, independent living, or memory care. While interning with Fairview Ebenezer, Natalee helped support their strong reputation of truly valuing their customers and providing appropriate care for their patients. 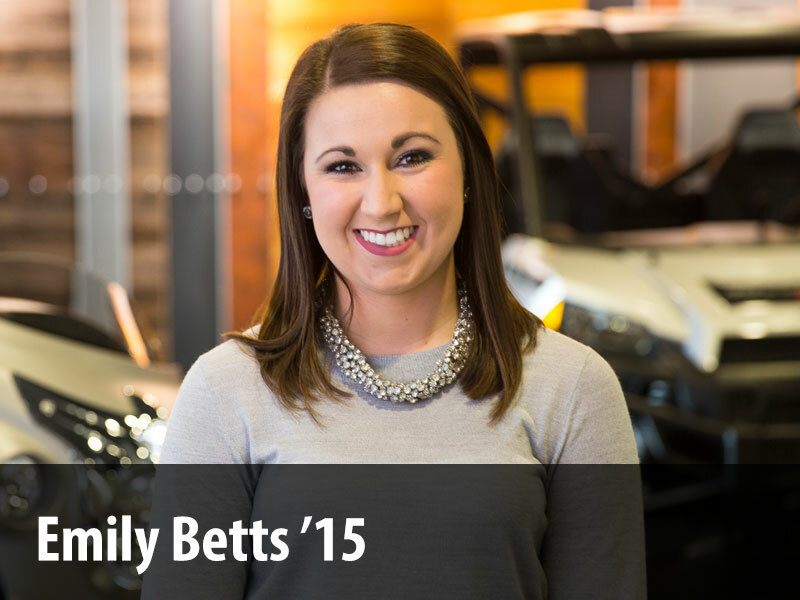 Natalee's primary task involved working with the director of sales and outreach. Under the director, she was responsible for logging information, contacting potential clients, and talking with current clients to check on their interest and satisfaction levels with the facility. Natalee was also responsible for filing patient medical information, organizing paper work, and taking inventory of monitors in current residents' rooms. Along with these daily tasks, Natalee's major responsibility was to create a large spreadsheet that included all of the residents, type of care they were receiving, their room number, phone number, and type of room they were in. Working with Fairview Ebenezer made Natalee realize that it takes a lot of people to run a business efficiently and although she doesn't plan on working in a senior living facility in the future, this internship helped Natalee discover her passion for sales. 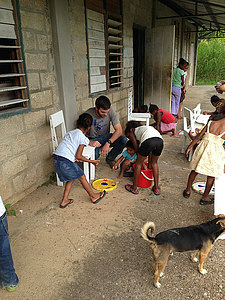 Clay was able to complete a biology internship in Belize during January term 2014. He spent time with the local Garifuna people, one of several different cultures that live harmoniously in the area. While there he worked with Garfuna doctor trained in both western medicine as well as traditional healing methods. This experience allowed him to see how medicine is practiced in a small town in a developing nation. 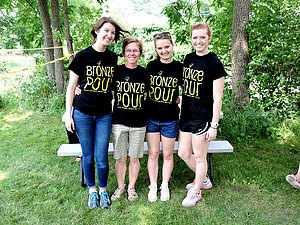 Anika spent the summer as an intern at the Wisconsin Badger Camp in Prairie du Chien, Wisconsin. The camp seeks to serve people with developmental disabilities by providing them with quality outdoor recreational experiences. Anika’s role at camp varied throughout the summer. 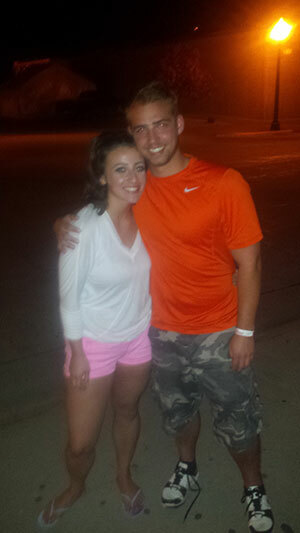 For several weeks, she was a main camp counselor, caring for campers and helping them participate in daily activities. She also spent time working as the equestrian director and the recreation director. This internship was a life-changing experience for Anika. She gained so much patience, compassion, and love for the campers she worked with and came to realize the importance of enjoying the little things in life. In regards to her psychology major, Anika feels more sure about the direction she is taking. She feels confident in her abilities to help people and is certain she can do anything she sets her mind to. Fred and Sarah got the chance to visit Gundersen Harmony Care Center. Along with two other students, they helped create a "memory choir" consisting of the residents. Together, they sang songs that the residents had learned when they were young. Sarah and Fred also taught them how to play percussion instruments as an accompaniment. 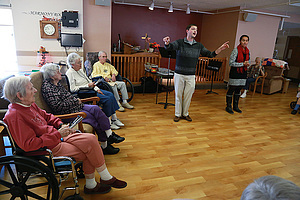 In early December, they even held a Christmas program for the residents to perform. Through this experience, Fred and Sarah saw how much music helped the residents come alive and express themselves. Both agree that patience and creativity played key parts in their success. During his time there, Fred realized that there are always opportunities to learn more. He saw this in the residents and in himself. Meanwhile, Sarah found this internship to be the perfect chance for her to step out of her comfort zone. Although it involved a lot of hard work, both of them agree that this internship has strengthened their decision to continue as music educators. 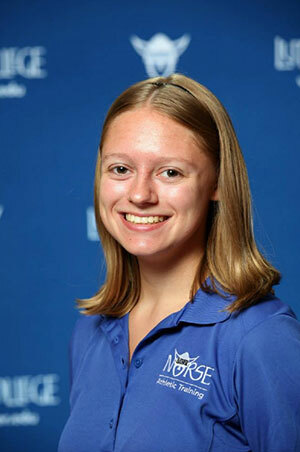 Hannah Tulgren is a sophomore majoring in art and minoring in management. 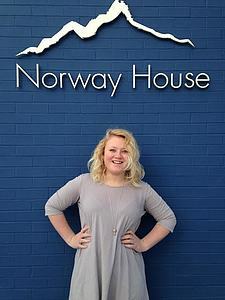 During the month of January, she worked with the Norway House art gallery, café, and bookstore located in Minneapolis, MN. Her internship focused on marketing and project management, which allowed her to blend her interests in art and business administration. Hannah found the internship to be incredibly valuable because it gave her an inside look at a volunteer-run non-profit. During her experience, she learned the importance of communication, time management, and collaboration. She also discovered a great deal about herself and her goals for life after Luther. KWWL News Channel 7 is a news channel based in Waterloo, Iowa. Hannah had the opportunity to intern there where she observed and worked with the producers, photojournalists, journalists, and reporters. 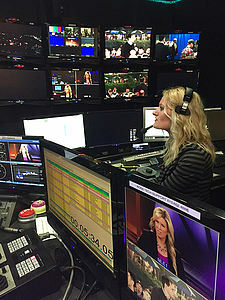 She gained hands-on experience writing the news, shooting and editing video, interviewing, and creating news packages. She realized that it takes a lot to physically produce the news, and that broadcasting news is more like a team sport. Everyone was positive and worked together to create something meaningful and important. Hannah knows that she chose the right major and minor to study because she was able to apply so many of the things she learned from various classes during this internship. Not only did she learn that coffee will be an essential beverage in her future, but found that working in the TV news business is what she wants to do with the rest of her life, which is extremely important.